Time to celebrate all mums, aunties, grandmothers, godmothers, besties! 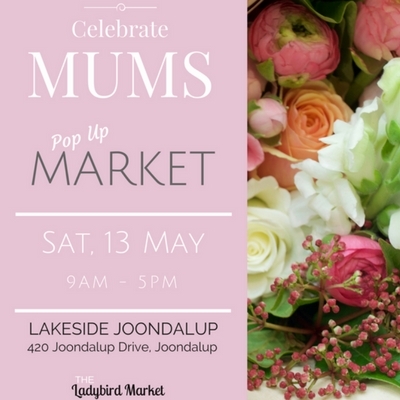 Our Pop Up Market is back at Lakeside Joondalup on Saturday 13 May. A chance to shop local and handmade and treat mum to something special! Don't leave your shopping until Mothers Day, make sure to visit our Pop Up Market on Saturday so you can celebrate with Mum on Sunday! Our pop up markets are boutique and unique bringing the best of WA handmade and designed creations and featuring over 35 Perth artisans, creatives and small businesses. You'll find a range of high quality items from artwork, candles, decor items, stationery, skincare, beauty products, jewellery, clothing, accessories, unique gifts, sweet treats, fresh flowers and much more, this time with a focus on all things Mothers Day Gift related! The Purist Collection will run a mini natural skincare workshop in the afternoon. To book go to https://www.stickytickets.com.au/52556 Tickets are only $30 each or two for $50 so book in with Mum or a friend and learn how to DIY your own products with everyday ingredients. PLUS make and take home two of your very own naturally therapeutic skincare products for yourself or as a gift! Chat to our amazingly talented stallholders, place a custom order perhaps or pick up something special on the day! Our events are carefully curated and showcase some of the best WA has to offer in both handmade and locally designed items so you know you are supporting local small businesses. This event is free and all are very welcome. There is also plenty of parking at the centre and as well as the treats you'll find at our market, there is also plenty of food options close to the market area. Find us upstairs on the level 1 Fashion Mall near H&M and Kookai. The Ladybird Market events feature Perth female creatives and their WA handmade and designed products and items, providing them with a platform to showcase their creations. Their Pop Up markets are boutique, unique and carefully curated to showcase some of the best WA has to offer in both handmade and locally designed items so you really are supporting local small businesses when you visit these markets. You'll find a range of high quality items from artwork, candles, decor items, stationery, skincare, beauty products, jewellery, accessories, home wares, clothing, kids clothing and accessories, unique gifts, sweet treats and much more. As well as the various pop up market locations, The Ladybird Market have taken part in and continue to be involved in some of the most popular larger Perth street festivals such as the Mount Hawthorn Streets & Laneways Festival, Vic Park Summer Street Party and the Light Up Leederville Carnival, with their own section of high quality handmade stalls. See the Facebook page to keep up to date with all events and featured artisans. Current Dates: (420 Joondalup Drive, Joondalup) Saturday, 25 Feb - 9am-5pm | Saturday, 25 March - 9am-5pm | Saturday, 29 April - 9am-5pm | Saturday, 13 May - 9am-5pm | Saturday, 17 June - 9am-5pm (Pop Up Market at Floreat Forum, Corner Howtree Place and The Boulevard, Floreat Saturday) 11 March, 9am-5pm | Saturday, 1 April, 9am-5pm.